Shortly before 4:00 p.m. on October 19, 1952, two F-86 Sabres were taking part in an airshow at Barnes Airport in Westfield, Massachusetts, when they were involved in a high-speed mid-air collision. The planes disintegrated on impact killing both pilots instantly. The men were identified as Captain Fred H. Stevens, 28, of Salem, Virginia, and 1st Lieutenant Robert H. Danell, 25, of Wakefield, Massachusetts. 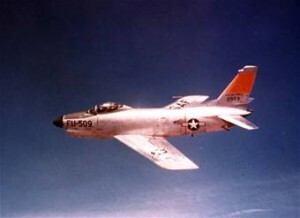 Both pilots were assigned to the 131st Fighter Interceptor Squadron of the Massachusetts Air National Guard. The airshow was part of the airport dedication ceremonies, in which four F-86 jets had been taking part. The accident occurred just after the four had completed a maneuver known as a “bombshell” in which the four jets would go into a steep climb and then peel away in different directions. In October of 2012, sixty years after the accident, a memorial honoring Capt. Stevens and Lt. Danell was dedicated at Barnes Airport.